Dip. A correction has to be made to the sextant altitude to allow for the height of the observer’s eye above the horizon; this is known as Dip. O is an observer’s position on the Earth’s surface and E is the position of his eye. We can see that, as the observer’s height of eye is raised above sea level, his visible horizon ‘dips’ below the true horizon and so the altitude measured at E becomes greater than that measured at O. Effect of Refraction on Dip. 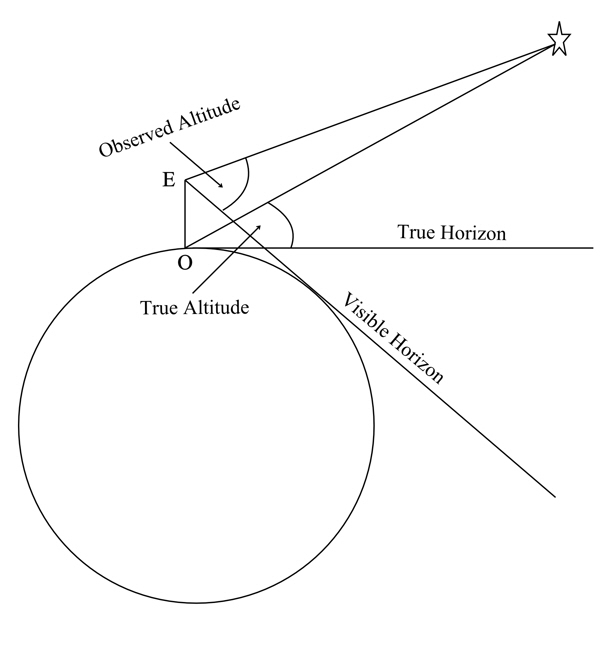 As well as increasing the apparent altitude of a celestial body, refraction also has an effect on the position of the visible horizon and this will in turn, have an effect on the angle of dip. The effects of refraction are illustrated in the next diagram. XEH is the true altitude from the observer’s height of eye. However, due to refraction, the celestial body appears to be at Y and so YEH becomes the apparent altitude. 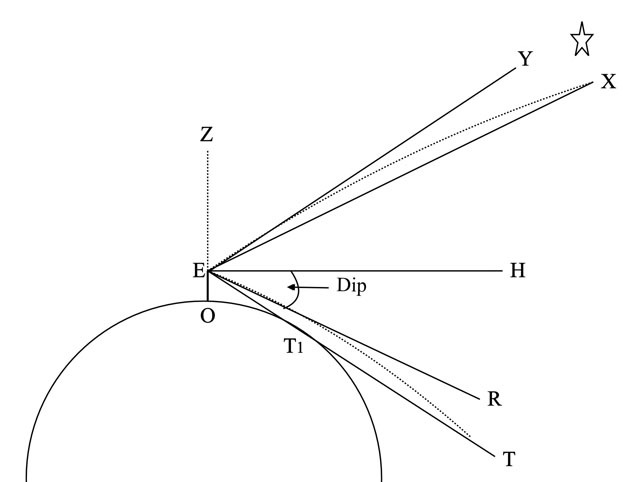 ET is a tangent from the observer’s eye to the Earth’s surface and so T1 should mark the position of the horizon from E.
The theoretical angle of Dip is the angle HET; however, because refraction causes the horizon to appear to be in the direction of R, angle HER becomes the angle of dip.